Using IT to improve literacy in K-12 students - Hewstone I.T. Students are growing up in a world where technology is everywhere, and the classroom is no exception. 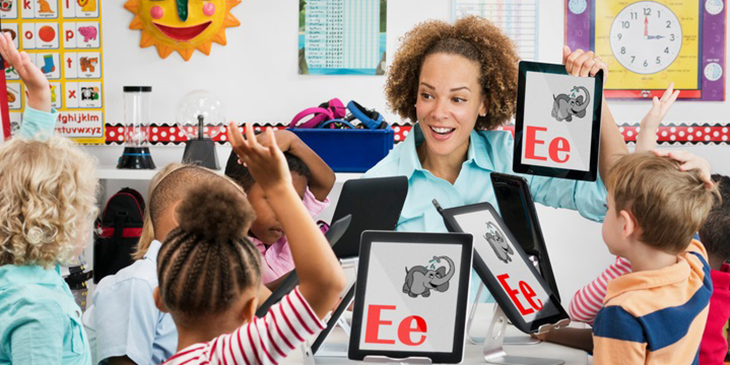 With the increasing proliferation of valuable technological learning tools, how can IT improve literacy for K–12 students? Understanding technology’s potential to improve literacy means examining how students learn and recall knowledge. The key is boosting student motivation and engagement in their learning. Students who are already interested in technology are more willing to engage with e-learning platforms in the classroom. ‘Gamification’ of learning is particularly effective through challenges and the opportunity to improve and advance. Learning in this way provides an experience students will value, which in turn supports information retention and reinforces a positive learning cycle. This ultimately engages the interest of students and boosts motivation to improve their reading abilities. For K–12 students, literacy now includes visual and spoken communication, digital communication and technological proficiency. Technology is perfectly suited to advancing these expansive forms of literacy, from e-readers, researching information online, engaging with others or supporting self-directed literacy improvement outside the classroom. Students can process text from many different sources where once they only passively engaged in a story’s narrative when reading traditional books. Technology allows students to construct their own stories, resulting in deeper learning and expanded literacy. In the digital age, technology is an excellent tool to encourage students to take their writing and storytelling to new levels. This can range from writing a story for an interactive flipbook to crafting a script for narration. It also allows students to develop new media literacy skills such as animation, digital image manipulation and video editing. Public speaking and presentation skills are of increasing importance in the 21st century. Technology in the classroom offers excellent tools for students of all ages to develop these skills, from creating videos and PowerPoint slide shows to constructing and delivering a presentation. Students benefit from an interactive experience, whether that’s crafting an argument and writing copy, or editing videos and animation. Honing these presentation skills in the classroom means students will have the essential skills they need for the jobs of tomorrow. Technology can provide a positive learning experience and support the development of literacy skills for students who have learning disabilities, including dyslexia. Assistive technology can help students with additional needs to produce text, spell and punctuate correctly. It also lets teachers personalise their lessons to each child in order to maximise learning opportunities and make progress at school. Reading software and apps can help students manipulate text and have words and sentences presented in a way that makes learning easier. Assistive technology is not only for students with additional needs. It can help any student with motivation, academic skills and social development. In short, all students can benefit from teachers integrating IT into the classroom to help them reach their full potential.